Alistair is a leading practitioner of ngā taonga pūoro. For over 18 years he has performed, composed, and collaborated with many of Aotearoa's finest artists, across genres of music and alongside various artistic disciplines. His ability as a musician, creativity as an artist, and respect for Te Ao Māori has given him the opportunity to elegantly weave his skills with taonga pūoro into projects that are at the forefront of New Zealand arts practice and pūoro Māori. In 2017, Alistair performed with Motu :: Oiléain (Trinity Roots with Irish Friends), STROMA, Bridget Douglas, New Zealand String Quartet, David Long and Natalia Mann (Utterance) and with the Waiata Māori Music Award nominated ensemble 'Auaha'. He is a member of ensemble 'Oro' who performed at the APRA Silver Scrolls 2017. His solo performances have gained wide acclaim. Alistair was a Wild Creations Artist Resident in 2011, a Churchill Fellow 2016 and is a researcher with Otago University. In 2017 Alistair began his three year position as a researcher for Otago University looking at Moriori and Māori taonga pūoro from Rekohu/Chatham Islands. Also in 2017 Alistair was a kaiako (tutor) at a series of wānanga ‘Toku Reo, Toku Ohooho’ run by Horomono Horo, that focused on composing and playing with ngā taonga pūoro. In 2016 Alistair performed with Patricia Grace and Aroha String Quartet for Chamber Music New Zealand’s 2016 Matariki Celebrations Te Marama, which featured his joint composition with Warren Warbrick for taonga pūoro, Te Marama. Alistair performed solo at CubaDupa, Coastella Music Festival, Dowse Art Gallery, and Opihi Taniwha Rock Art site for Ngai Tahu’s Te Ana Rock Art Museum Waitangi Day festivities. Also in 2016 Alistair composed a work for taonga puoro and electronica Wai=Rua for the dance/theatre work Wai=Rua A Line=Near by Marty Roberts and Rua McCallum. Other performances of note are Museums After Dark at Cambridge University Museum of Archaeology and Anthropology (May 2015) and a season of This Other Eden (October 2014) an opera by Anthony Ritchie to which Fraser contributed ngā taonga pūoro parts. In December 2014 Alistair toured with Ngai Tahu songstress Ariana Tikao and Richard Nunns. 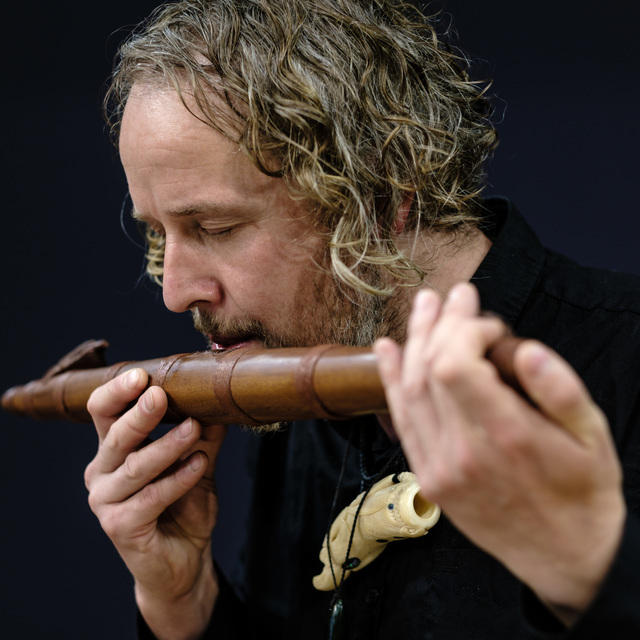 Alistair performed and composed works with Jeremy Mayall during Mayall’s time as Mozart Fellow at Otago University (2014-2015) producing four co-composed works by Mayall and Fraser, Along the River Run, He Korokoro Tui, Otakou Lullaby and Still. In 2014 Alistair was commissioned by Ngā Taonga Sound and Vision to compose a twelve-minute work to accompany a showing of archival footage of traditional food gathering that toured South Island marae as Te Waipounamu Marae Film Tour: Otautaki Ki Awarua. Also in 2014, Fraser composed a work for ngā taonga pūoro and vocal for Te Papa Tongarewa and Ngati Toa Rangatira’s exhibit at Te Papa Tongarewa Whiti Te Rā! This work was performed by Tāmihana Katene (taonga pūoro) and Wairere Ropata (vocal), both from Ngati Toa. In 2013 Richard Nunns, Paddy Free and Alistair Fraser co-composed a 23-minute work for taonga pūoro and electronica for Orokonui Ecosanctuary. Alistair contributed taonga pūoro peformances with ensemble ‘Reo’ (Horomono Horo, James Webster, Charles Royal and Paddy Free) and arrangements at all of Charles Royal’s Te Whare Tāpere ki Waimango 2010-2014.